While it remains to be seen whether President Donald Trump will act on campaign promises to get tough on Beijing, the American public has largely soured on China in recent years. In a January survey by Pew Research Center, 65% said China is either an adversary (22%) or a serious problem (43%), while only about a third (31%) said China is not a problem. And in a separate spring 2016 survey, a majority (55%) of Americans held an unfavorable opinion of their largest Asian rival. In the United States, negative views of China increased by 26 percentage points between 2006 and 2016. 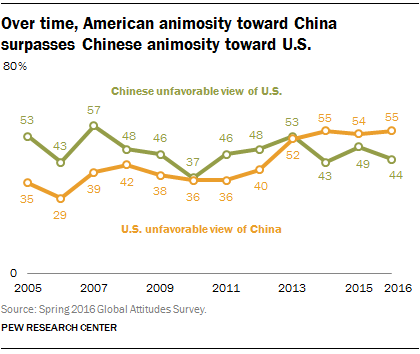 And American negativity toward China has been higher than Chinese negativity toward the U.S. in every year since 2014. By comparison, Chinese unfavorable views of the U.S. remained below 50% for most of Barack Obama’s presidency. In both countries, those ages 50 and older are more likely than those 18 to 34 to view the other nation unfavorably. But even among young Americans (as among all other age groups in the U.S.), negative views of China increased over time, rising 21 percentage points between 2006 and 2016. However, Chinese youth warmed to the U.S. over the same time period, with unfavorable views falling 12 points. 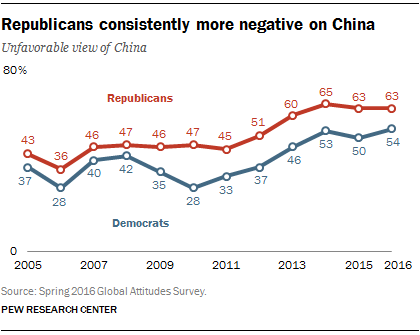 In the U.S., Republicans have consistently had more unfavorable views of China than Democrats. In the 2016 survey, for example, 63% of Republicans held an unfavorable view of China, compared with 54% of Democrats. But over the past decade, unfavorable sentiment has increased among supporters of both parties by more than 20 percentage points. As Americans have become more negative on China, they have also become more downbeat about their country’s global stature. 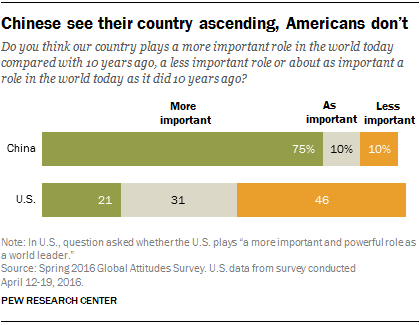 In 2016, a 46% plurality of Americans said the U.S. plays a less important and powerful role as a world leader compared with 10 years ago. This figure was up 26 percentage points from 2004, when just 20% believed American power was waning. The Chinese public, on the other hand, sees its country’s influence on the rise. Three-quarters of Chinese believe their country is playing a more important role in the world today compared with a decade ago. 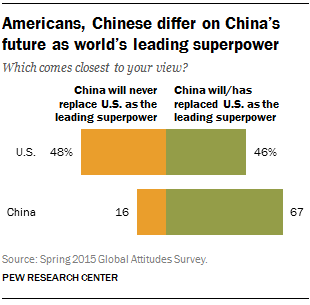 And when it comes to the global balance of power, two-thirds of Chinese said in 2015 that their nation would eventually replace the U.S. – or had already replaced it – as the world’s leading superpower. Americans, on the other hand, were split. About half (48%) believed China would never surpass the U.S. as the world’s leading superpower, while 46% said that China would eventually replace the U.S. or already had. By contrast, in 2009, a majority (57%) of Americans thought China would never overtake the U.S. as the top global power.